Love is all there is to talk about. It is the only thought that we can share with God. It is the only thought that goes beyond thought and connects us to Reality, which is all-encompassing Love with no opposite. In our dualistic world of infinitely important persons (sic!) “love” is usually attachment. It means that I see something in you that I really want or need and you see something in me that you really want or need, so we attach to one another and feed off each other! Real Love is not personal just as God is not personal, the real God, that is, not the Biblical Jehovah who is a man-child of a person, choosing a few special people and cursing all the rest, throwing temper tantrums like destroying the world, then repenting of it saying, “Oops. I shouldn’t have done that. Here’s a rainbow for you to show I won’t do that again.” Even the “love” mentioned in the New Testament (as in 1 Corin. 13) is still dualistic because the Bible cannot see beyond dualism. There is always an “I–Thou” relationship, never a joining. In true love, the lovers are One. They are One Love in two illusory bodies and they light the way for the true reunion that must happen; the bringing together of each piece, each broken shard of the One Son of God who is seen splintered here in this illusory universe, having forgotten he is Spirit, believing he is a body, subject to time and feeling lack. He tries to connect to other bodies who also have forgotten they are Spirit and experience lack. This is attachment, the broken son of God’s substitution for the all encompassing Love he truly is. Attachment doesn’t satisfy and if people marry with it they get tired of marriage and divorce. So how do we find this real “Love?” First we would need to acknowledge, as does ACIM, that this Love is our natural inheritance and our true Self, that we are a part of God’s radiant loving light, from which we can never be separated. We have erected barriers to the awareness of Love’s Presence. The biggest barrier we erected is the WORLD!! ACIM says that the dreaming Son dreamed up this world as a place God could enter not! The body is his ultimate citadel against God! But this illusory world can be de-constructed. Every time I look on another and see that what is in his best interest is also in mine, a little light has come to us. I begin to find that if I refuse to make opinions about you that more light comes. As that light comes I begin to feel Love when I am in your presence, a Love which comes to both of us. In that moment my barriers are down and Love’s Presence comes into my remembrance. It joins you and I as One Spirit in two illusory bodies. The bodies are silly things. The Love is all important. This Love we share with God and remember for all our brothers. Love is all there is to talk about! Apparently, when we dreamed THIS universe, we also dreamed others! We appear to live simultaneous lives in these alternate worlds, yet we are the same spirit learning lessons designed to awaken us. The knowledge of this should relieve some of the angst we have in living THIS life. High Sense Perception, ESP, Spiritual abilities can make us aware of, even let us peek into, these alternate lives. In the alternate life I saw for myself, I was living in a high rise apartment. My wife and I were both music teachers; she taught piano and I voice. We were well off financially. I had the things that I think I need now, yet in that alternate life I was less spiritually developed than I am now and I had a deep desire to know more. Whatever it is that we THINK we need in this life, what we really need is NOT THAT. Our need is always to KNOW who we are. “Someday Joe-boy will take us fishin’,” Lena Ritchie said to her husband, George. It was four o’clock in the morning and grandmother had put a nice breakfast on the table for us. We needed a good start of the day for our fishing trip. I had slept over at their house so we could get a good early start down to Oklahoma, to the Grand Lake O’ The Cherokees. I was eight years old. When I was about seven years old, grandmother and grandpa introduced me to the wonders of Grand Lake O’ the Cherokees in nearby Oklahoma. For years they had been going there to the promised land of fishing, bringing back huge catches of crappie, blue-gill, catfish, and white bass, all for table fare. Having survived the great depression, they were determined never to go hungry again. A huge freezer chest of frozen fish from Grand Lake made it seem unlikely. And yet, like our river adventures, the important thing was really to go to the lake and be there. At Grand Lake, no convenience was denied a fisherman. Large in-door, heated fishing docks, with theatre seats for comfort, were situated over key areas for crappie and other pan fish. Cedar trees were suspended from the docks to entice the cover-minded crappies to huddle there in schools, unaware of the fate which awaited them. It was a grand invention for a Grand Lake. Grandmother and grandpa introduced me to these holy haunts with a fervor reserved otherwise only for the garden. Fishing with my grandparents was the purest form of Love I learned as a child. Most days you could not have gotten me out of bed at 3:30AM if you lit a fire cracker under my bed, but knowing we were going fishing, I eagerly went to bed with my grandparents and the chickens around dark and jumped out of bed when I heard the alarm at 3:30AM. Grandmother would fix breakfast while grandpa and I loaded the car with our fishing tackle. “Someday Joe-boy will take us fishin’ George,” Grandmother repeated. “You betcha,” said grandpa as he reached for his coffee. They drank the most terrible coffee: Folgers, or Maxwell House, percolated in what is now an ancient contraption. They drank it black and I drank it with them. Maybe eight years old was just a little young for coffee, but I drank it! Grandmother packed a lunch for us and put plenty of that coffee in thermos bottles for us and off we went. It was so exciting to start off on our journey while it was still dark, the crickets still chirping, and the neighborhood still asleep. 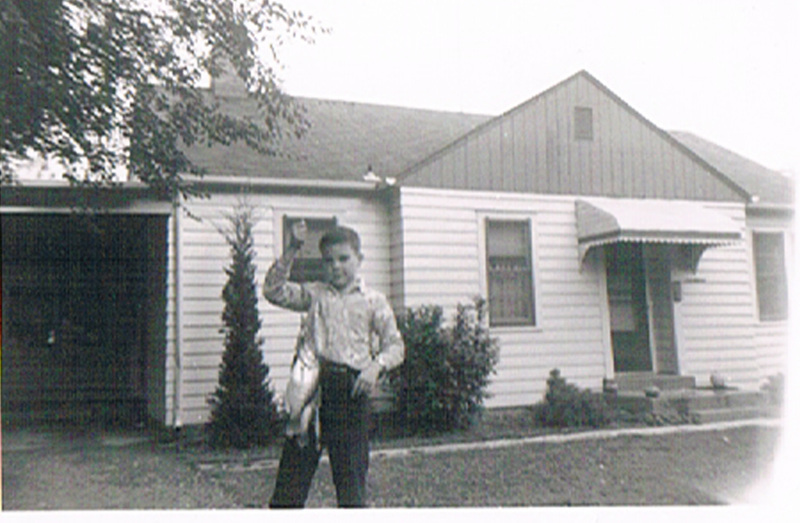 We drove the old highway to Joplin to a bait shop where we got our minnows, worms, and catfish bait. The best thing I knew about Joplin as a boy was that it wasn’t far from Grand Lake! Grandpa liked to drive old highway 60 through the big town of Seneca Missouri on route to Grand Lake. Grandmother and I might be nodding off but grandpa would loudly announce, “We’re now in Sen-ee-kee,” and we would pop to, knowing that the lake was near. Outside of Seneca there was a fork in the road and we would have to decide if we were going to go to Twin Bridges fishing dock or on down the lake to Ice Box Bluff or Blue Bluff. This day we made the turn as grandpa said, “Let’s go to Ice Box.” It was grandpa’s favorite dock and the owner was a friend of my grandparents, but then many dock owners were their friends. It was the first dock I fished when they brought me to the lake a year before. It was like heaven to a kid. All the grownups there didn’t act like grownups. They were all fishin,’ acting like kids! Eighteen years later, I had graduated from college, spent two years in graduate school for theology, and was on my way to a new career as an opera singer. But before I left for the Santa Fe Opera and a new career that would take me away from them, I said to my grandparents, “It’s time I take you fishing.” They were both startled, like they couldn’t quite believe the day had come, but they quickly agreed. I was driving an old Rambler that had the “b” and the “l” knocked out of the front grill so that it read “Ram—er.” It shimmied if you went past 55 but off we went in it one clear day about 4:00 AM. Grandmother sat in the back and grandpa sat up front. I took the same route grandpa had always taken, into Joplin, to the bait store, down through Seneca. We came to the fork in the road and I said, “Let’s go to Ice Box.” Off we went. I don’t remember how many fish we caught but there was something wonderful about the completion of Love in that outing together. As I drove back home, I accidentally pushed the speed up past 60 and the old “Ram—er” began to shimmy. Grandmother said, “Boy the old thing shimmies doesn’t it?” I slowed back down to 55 and we made it back home. That was the last time we went fishin’ together. I moved on up to the big city, up to NEW YORK CITY, and became an opery sanger, but my love for Lena and George Ritchie has stayed in my heart strong! They loved me…and I loved them back. The fish were just part of the story. I am not a medium for nothing! 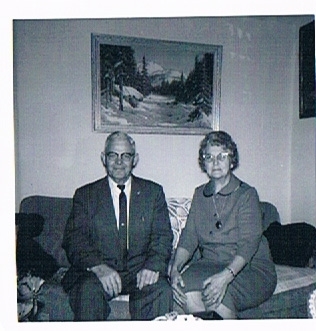 This story about my grandparents was prompted by my inner conversations with them in spirit. They are both still in spirit and together. Grandmother said, “We know how much you want us to meet you when you pass over, so we have been staying here for you.” Grandpa smiles. Grandmother chuckles and says, “Boy, we’ve been having to put off the angels that keep coming and want us to go back down.” Grandpa grins. “We’ll be here to meet you. Don’t you worry.” Grandpa says, “I’ve been trying to tell you not to use so much of that nose spay. It’s not good for you. But you cain’t hear me.” I am taken up in Love’s Presence with these little conversations in spirit. Believe me, there is not much separating us from our loved ones who have passed over. Grandmother chuckles, “Boy howdy, let me tell you Joe-boy, it is goin’ to take you a little while to adjust when you come over here. We were not prepared at all for it.” She laughs big. Tonight I needed to go get something to eat. Instead of hopping in my car, I knew I should walk over to the shopping center and to Subway. Walking is not easy for me now and would never be my first choice, except tonight. I just wanted to wall slowly. Conversations with George and Lena continued in my mind as I walked, and the Love poured out. The girl at Subway recognized me and I flirted with her a little bit. That’s one of the nice things about being my age. You can flirt with the girls and nobody is offended. As I walked back to my apartment my whole life gently passed before my eyes. Somehow, there was something sweet about walking slowly with my cane and seeing the gentle irony that I used to be a dashing figure on the stage, running around as Macbeth or some other great character. What a figure I cut. Now my pace is slow and I need my cane, but it is alright. Nothing is amiss. I am no longer very famous and all my money is gone, but somehow, in a very sweet way, I am happy. I am thankful for my life and I have learned many lessons. I wanted this to be my last lifetime on this planet, but you know, if I have to come back a hundred more times, that is alright too. It is all alright. Will You Choose For Love Or Fear?